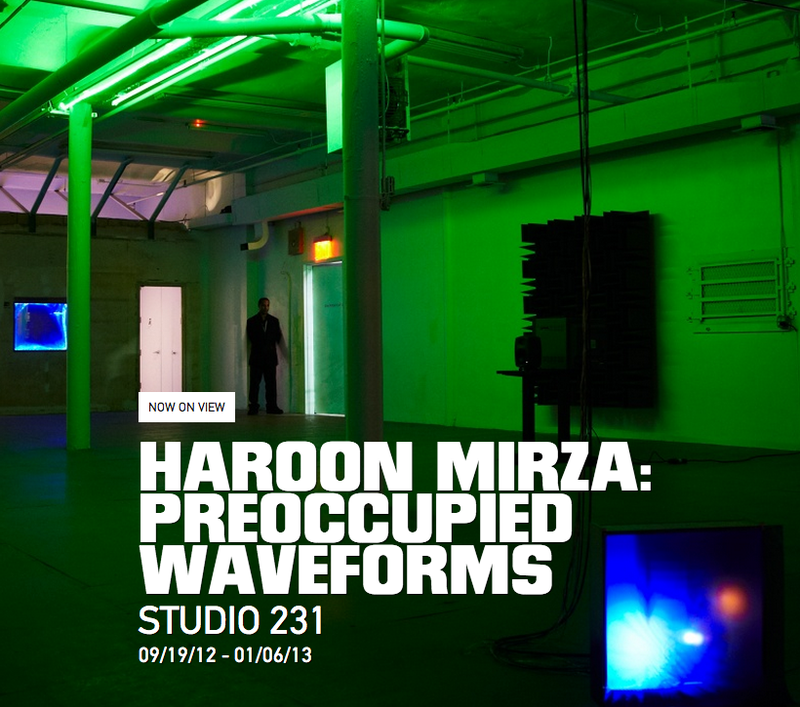 Haroon Mirza’s piece is a piece which is shown uniquely next door, which is really easy to miss or cannot enter because of hardly finding museum’s ticket. For my first sight, his work is not as fancy as what I thought before. Single colored LED lights, that kind of really cheap one, lie on the floor laxly, surrounded by several sound-absorbing sponges which are in a very exaggerated shape (compare to the one in our lab). Nearby, there is a LED plate with three RGB dots on it. On the right side, a standing speaker rhythmedly create a low sequence beat, which is really loud, every time the beats come, it feels like something hit on your eardrum. In addition, two little monitors face each other across corners, one of them generates endless varied codes, the other one shows video clips seems like someone is sitting in front of the television keep changing channels and trying to find something to watch. On the wall facing to the entrance, a blue desultory LED square is hanging there with the reflection on the background, because of the wind blowing front the back, the reflection is kind of twisted and shaking. At first, I thought it is a room filled with several pieces of works by Mirza, but just after couple seconds, I realized that everything in this room is so connected. They are connected subconsciously, not in a physical way. More like all of them are controlled by a director high beyond the room, gradually guide the audiences to find the connection between each other, to see and listen to the arrangement of time. Suddenly, Mirza’s work becomes the world around us, We search for the connection while getting the informations from all directions. It’s kind of like our real life, right? We are so take part in this place, but the light and sound pass us too quickly, randomly, from all directions, we could never tell which way we should facing at for next beat or twinkle.